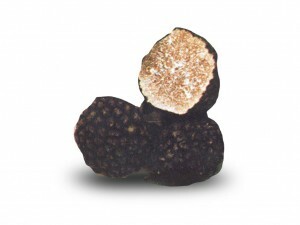 In Italy Tuber Aestivum Vitt it is commonly called summer truffle or scorzone. 7g – 70/100g and more. Black warty surface, with large bulging pyramidal warts, which give it a typical roughness and consistency. Generally brown in color, more or less yellowish in the mature truffles, often lighter in color; is crossed by numerous whitish veins, some thin others wider, very branched and variously anastomosed. Delicate and pleasant, soft when young, more intense fully ripe or in an enclosed (glass jar). Calcium, generally grows in or near the surface. It grows near or under oaks, pine, ash, hazel, beech. Wide distribution area in Italy: Piedmont, Lombardy, Liguria, Emilia, Tuscany, Romagna, Umbria, Marche.